TUNE IN TO THE EXCLUSIVE LIVE STREAM STARTING AT 9:00 PM ET ON VERIZON's FACEBOOK PAGE, FIOS TV, MYFIOS APP AND THE PIRATES OF THE CARIBBEAN FACEBOOK PAGE. The Premiere of Disney’s and Jerry Bruckheimer Films’ “Pirates of the Caribbean: Dead Men Tell No Tales,” with Johnny Depp as the one-and-only Captain Jack in a rollicking new tale of the high seas infused with the elements of fantasy, humor and action that have resulted in an international phenomenon for the past 13 years. https://www.image.net/potc5la immediately following the event. The rip-roaring adventure finds down-on-his-luck Captain Jack feeling the winds of ill-fortune blowing strongly his way when deadly ghost sailors, led by the terrifying Captain Salazar (Javier Bardem), escape from the Devil's Triangle bent on killing every pirate at sea—notably Jack. Jack's only hope of survival lies in the legendary Trident of Poseidon, but to find it he must forge an uneasy alliance with Carina Smyth (Kaya Scodelario), a brilliant and beautiful astronomer, and Henry (Brenton Thwaites), a headstrong young sailor in the Royal Navy. At the helm of the Dying Gull, his pitifully small and shabby ship, Captain Jack seeks not only to reverse his recent spate of ill fortune, but to save his very life from the most formidable and malicious foe he has ever faced. 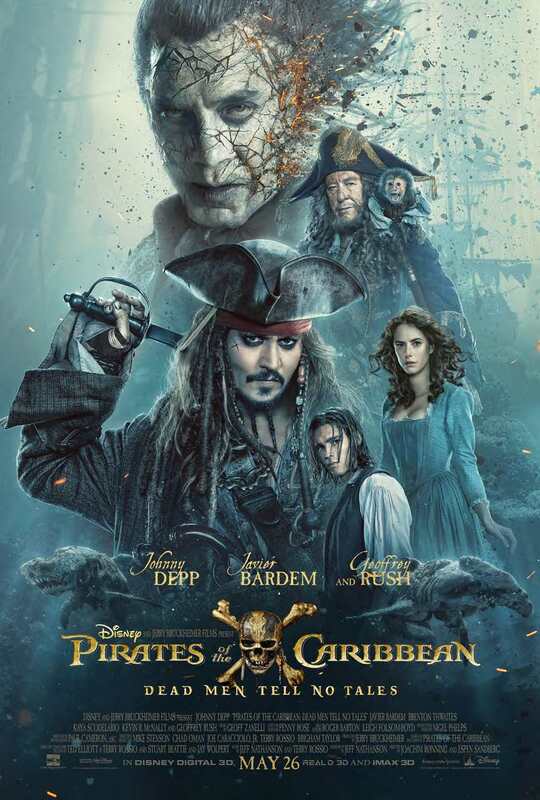 “Pirates of the Caribbean: Dead Men Tell No Tales” also stars Kevin R. McNally as Joshamee Gibbs, Golshifteh Farahani as the sea-witch Shansa, David Wenham as Scarfield, Stephen Graham as Scrum, Orlando Bloom as Will Turner, and Geoffrey Rush as Captain Hector Barbossa. Joachim Rønning and Espen Sandberg are directing “Pirates of the Caribbean: Dead Men Tell No Tales” with Jerry Bruckheimer producing. The executive producers are Mike Stenson, Chad Oman, Joe Caracciolo, Jr., Terry Rossio and Brigham Taylor. The story is by Jeff Nathanson and Terry Rossio, and Jeff Nathanson wrote the screenplay. Verizon is bringing the best of the digital world by sponsoring the live stream of the Disney’s “Pirates of the Caribbean: Dead Men Tell No Tales” Premiere. Featuring interviews with cast members and filmmakers, the live stream will provide fans with an insider’s view of the red carpet. It will be available on the Verizon Facebook page, Fios TV and myFios app. VOD will also be available on these platforms including AOL app, AOL.com, and AOL Facebook page. LORAC Los Angeles was born more than two decades ago as the leading Hollywood professional artist prestige cosmetics brand. Our deepest purpose is to build on our red carpet heritage and inspire self-confidence by making you feel like a star. We work as a family to design and bring to life color cosmetics, artistic inspiration and educational techniques inspired by Hollywood glamor and fresh L.A. style. We promise to always help you look and feel beautiful without breaking the bank.